Eastern senior Alyson Bailey goes for a layup in the second half of the Lady Eagles’ 50-44 victory on Thursday in Tuppers Plains, Ohio. TUPPERS PLAINS, Ohio — A wire-to-wire win to start the year. 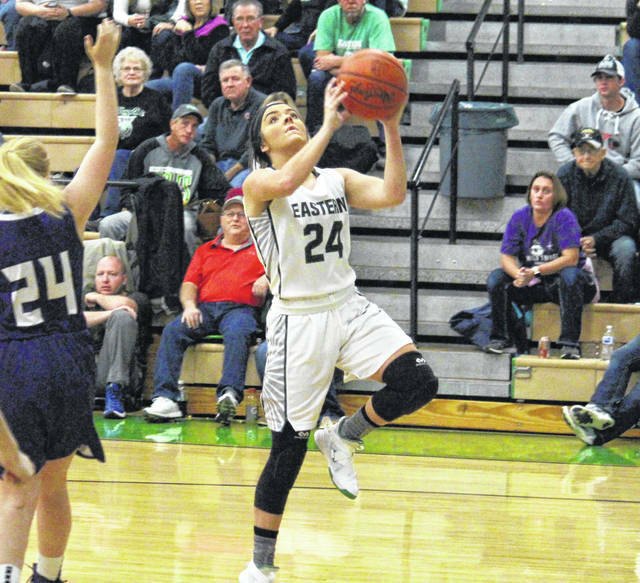 The Eastern girls basketball is off to a 1-0 start to the season, as the Lady Eagles gained a 2-0 lead 45 seconds into play and never relinquished on Thursday in Meigs County, ultimately defeating Tri-Valley Conference Hocking Division guest Miller by a 50-44 count. The Lady Eagles (1-0, 1-0 TVC Hocking) started the night off right, holding Miller (1-1, 0-1) without a field goal for the first five minutes, while bursting out to a 12-3 advantage. Eastern was held scoreless for the last three minutes of the period, however, as the Lady Falcons trimmed the margin to 12-8. MHS made it a one-possession game during the middle part of the second quarter, but Eastern closed the half with a 7-3 run and a 24-17 lead. The teams played evenly in the third period, with both squads tallying nine points in the opening four minutes, before going scoreless in the next four. In the opening 2:30 of the fourth quarter, Miller cut Eastern’s lead to three points, at 36-33. 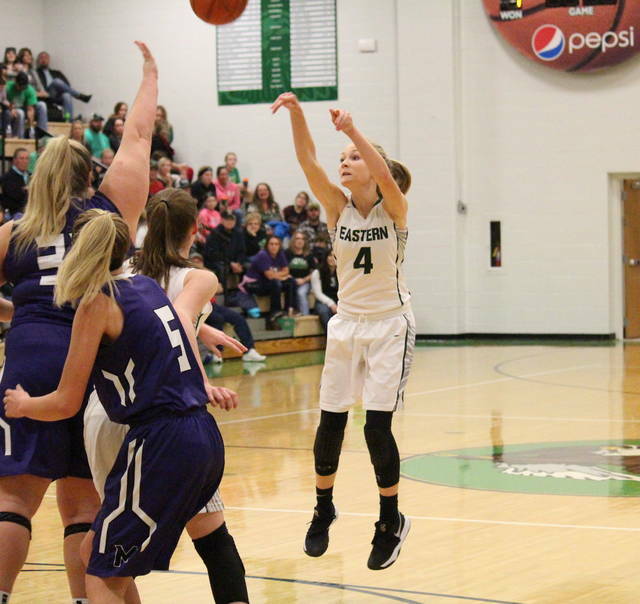 The Lady Falcons eventually trimmed the margin to two points, at 46-44, with 1:12 left, but Eastern senior Kelsey Casto knocked down four straight free throws to seal the 50-44 victory for the hosts. Third-year EHS head coach Jacob Parker acknowledged it wasn’t perfect, but was still pleased with the triumph. Eastern shot 15-of-53 (28.3 percent) from the field, including 6-of-17 (35.3 percent) from three-point range, while Miller was 15-of-45 (33.3 percent) from the field, including 2-of-12 (16.7 percent) from deep. At the charity stripe, EHS was 14-of-25 (56 percent), while MHS was 12-of-28 (57.1 percent). 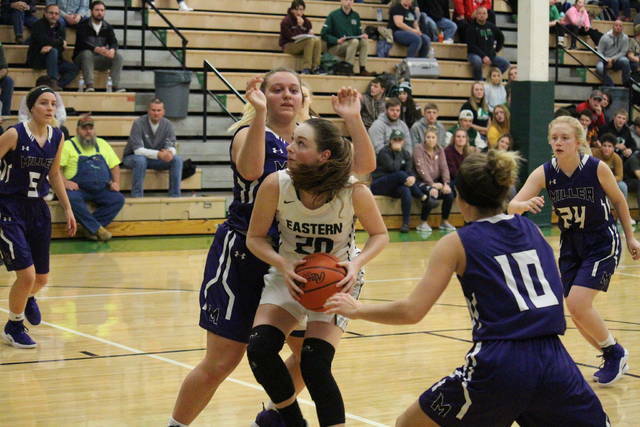 The Lady Falcons claimed a narrow 35-to-34 rebounding advantage, despite Eastern’s 18-to-12 edge on the offensive glass. The Lady Eagles finished with 12 assists, 20 steals, two blocked shots and 28 turnovers, while the guests totalled eight assists, 12 steals, four rejections and 27 turnovers. 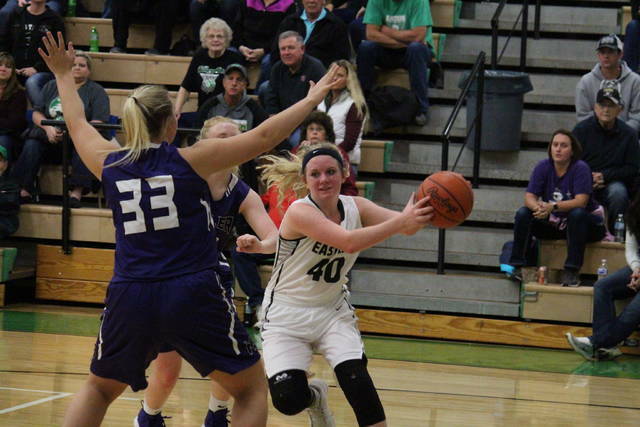 The EHS offense was led by senior Alyson Bailey with 17 points and four assists. Jess Parker was next with 11 points and four assists, followed by Kelsey Casto with 10 points and a team-best nine rebounds. Ashton Guthrie contributed five points to the winning cause, Whitney Durst added four, while Olivia Barber chipped in with three. The Lady Eagle defense was paced by Jess Parker with six steals and Bailey with five, while Barber and Kennadi Rockhold each blocked a shot. Miller was led by Ashley Spencer with 17 points and nine rebounds. Askya McFann had seven points and a pair of steals, Josie Crabtree added six points, while Haillie Joseph totalled four points and two rejections. These teams will rematch on Jan. 10 in Perry County. After a non-league bout at Peebles on Saturday, Eastern will resume TVC Hocking play at Belpre on Monday.